Simple shooting drill that encompasses a number of skating and stick skills. Players line up on the four dots with pucks in all four lines. Opposite lines start. Player one makes a pass and then skates a button hook pattern with a mohawk maneuver at the end. The player in the line opposite receives the pass and bumps it to the next player in the line that started the drill. That player then passes to the player who skated the pattern who goes in and takes a shot. 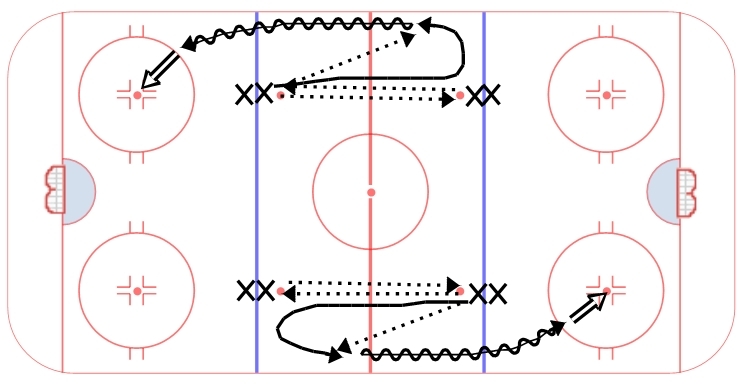 Another variation is to have the player who skates the pattern exchange with the opposite line twice while skating towards them, then receive a flat pass while they are mohawking towards the boards. While the execution of the drill is simple, players need to focus on doing everything at full speed. Passes should be flat and on the tape. The skating pattern should develop a players ability to use their edges. Player need to attack the net hard with a wide drive and shoot in stride, stopping at the net for a rebound opportunity.